Recorded before a live (and delighted) audience, best-selling author and audio star Denis Waitley presents a captivating and inspirational program that will allow you, quite literally, to re-create yourself and your outlook on living. Dr. Waitley not only shows you how attitude can trigger your success--he'll explain how to develop that attitude by enumerating and elaborating on the 10 positive attitudes, and their matching actions, that will lead you directly to a winning style--and a winner's life. 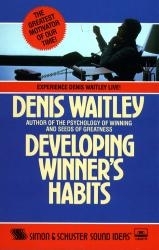 From self-awareness to self-projection, Developing Winner's Habits sheds light on the key components of every winner's profile:Control: you're driving---and you can go where you want!Optimism: the natural high!Your inner thermostat: turn it up to reach new heights!Discipline: practicing within---when you're without!A witty, thought-provoking, and truly exciting speaker, Denis Waitley is out to change your life. Get hooked on the healthiest habit around--the habit of winning!